While adding Retina Display support to TweetStation I learned a couple of tricks that I figured would help other developers. Apple's Retina Display conveniently doubles the number of pixels on each dimension, the previous iPhone display had 320x480 pixels while the new new phone has 640x960 pixels. To make existing applications run out of the box on these new displays Apple changed the units on the display and instead of using pixels they now use points. They are not really typographical points, but iOS "points". Both the old iPhones and the new iPhone have a resolution of 320x480 points. This means that existing code that absolutely positioned views on the screen will get the views laid out in the same positions regardless of the device that the code is running on. In UIKit points are interpreted based on the value of the UIView.ContentScaleFactor. If the value is 1.0 each point is mapped to one pixel. If the value is set to 2.0 each point is mapped to four pixels (2x on each dimension). UIKit layout and CoreGraphics rendering primitives will automatically take this factor into account and position and render accordingly. To export the same image at high resolution, set the DPI in the dialog box to 180. 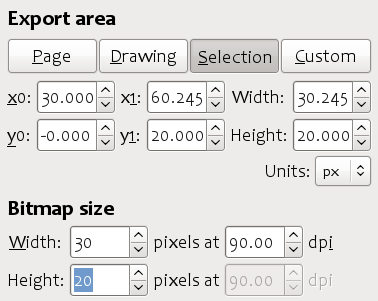 Inkscape will automatically change the width and height for you. 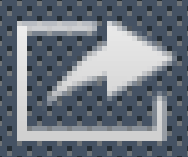 The blurry sides of the retweet icon were caused by the math code setting the X position of the image at a fraction of a point (0.5). Loading images with more pixels for the background texture and the icons wont do you any good if you are drawing the images yourself. You will end up with a context that has 200x200 points, but will automatically double all of your pen widths and will scale any images up. If you had a high-resolution image, it will first be scaled down when rendering to the context, then scaled up when rendering the data. Apple's Supporting Resolution Independence document has more information.